Baltimore Ravens guard Marshal Yanda (73) during an NFL football game against the Arizona Cardinals, Monday, Oct. 26, 2015, in Glendale, Ariz. Right guard Marshal Yanda continues to be regarded as one of the NFL's best at his position. For the second straight season, Ravens right guard Marshal Yanda has been named an Associated Press first-team All-Pro. 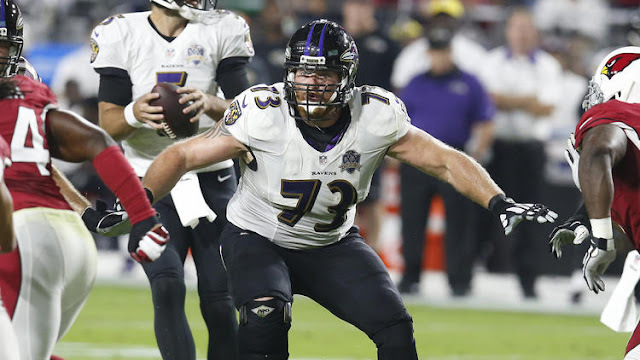 Yanda, a five-time Pro Bowl selection, was the lone Raven on the first team, which included six members of the NFC's top-seeded Carolina Panthers. Of the players selected to the first team, 15 were from the NFC and 12 were from the AFC. Yanda and the Pittsburgh Steelers' David DeCastro were the starting guards on the first team. Yanda, 31, started all 16 games for a third straight season and was the top performer on the Ravens' offensive line. He was voted the team's Most Valuable Player in a voting by the team's media. The Ravens locked up Yanda to a four-year, $37.4 million contract extension in October. Yanda and punter Sam Koch are the Ravens' lone Pro Bowl selections.